February can be a rather bleak month. Traditionally I have found it more of a month to endure than enjoy...days of cloud and cold, salt and slipping, standing against the icy winds that whip down between the tall buildings of Bay Street in Toronto. Last month however I had the chance to go to Tucson, Arizona to visit my dear friends Walt and Billie McCandless. Throughout high school I never went to Florida, to Europe, or to the Caribbean. I didn't mind, as I didn't know what I was missing. However, I have to say, there's nothing quite as refreshing as going for a run in the sun, not a cloud in the sky, 18 degrees out, in the middle of February. I was thrilled to see Walt and Billie as usual. They are always such gracious hosts, showing me around and letting me do some exploring on my own too. Where you are is only part of the experience. Who you are with is just as, if not more, important. When I visit Walt and Billie I know that there will be lots of discussions about science, human nature, the vagaries of the human condition, laughs, affection and the enjoyment of very special friendship..
Tucson in February is pretty much perfect weather. 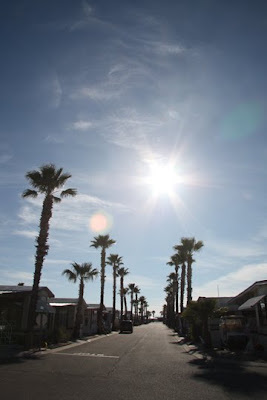 Cool mornings and evenings, with a daily high of around 18-20 degrees. Plus, as they say, the heat is dry...there's no humidity. You don't even have a chance to sweat. Well, that's an exaggeration but you get my point. Subsequently I found that I had to constantly drink lots of water to stay adequately hydrated. It was an ongoing battle for sure. This is the same as in Alaska I find. In fact that is one of the many parallels I noticed between the two places. Walt and Billie's Street in Tucson. From the moment I landed in Tucson, I noticed the thin air...fresh, but thin. It was not heavy, but had a light quality to it. It was not oppressive at all but pure and clean. I also noticed a lack of air pollution...I could see clearly peaks and mountains on the horizon. That very rarely happens where I live in Southwestern Ontario. In fact, this quality was magnified at night, when stars blanketed the sky as I walked back from the pool to Walt and Billie's, and I gazed upward. I felt as though if I reached out I might touch them, and float away. It made me dizzy, a like visual champagne: sparkling and clear. Aaron, a good friend of Walt and Billie's arrived shortly after I did. He had purchased a used RV and driven it from Seattle. 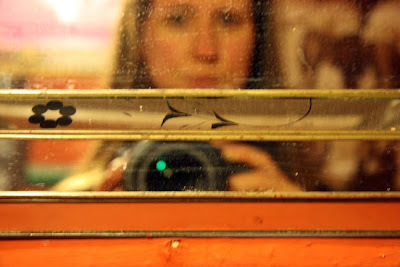 We are both offbeat and travelers by passion. Aaron is explorer who is always on the move, cerebrally or literally as well.. We hit it off immediately. A small group of us headed down to Tubac one day. 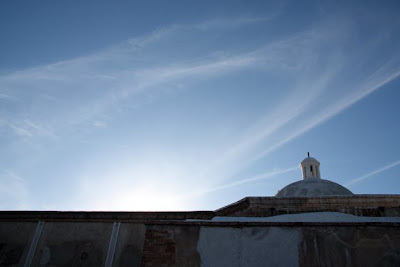 Tubac is very VERY close to the border with Mexico, and we passed police checkpoints on the way back to Tucson. 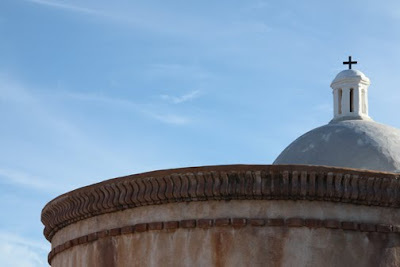 Tubac is a historic town that has a state park, an old mission, and, most notably, a little village of artisans and vendors. 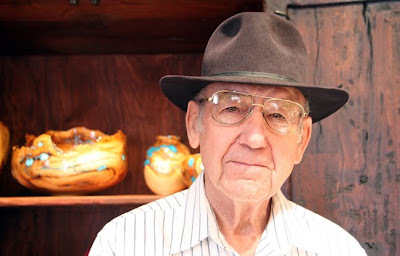 I was enthralled with the furniture, art and style of the southwest as there was lots of that unique character found in Tubac. Aaron and I had a quick peek around before meeting the rest for dinner. 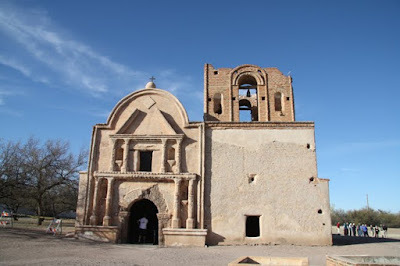 We had less than an hour to explore Tumacacori. We made the most of the time and then walked back along the highway to the restaurant 1 km away (rather harrowing at times with cars flying past). 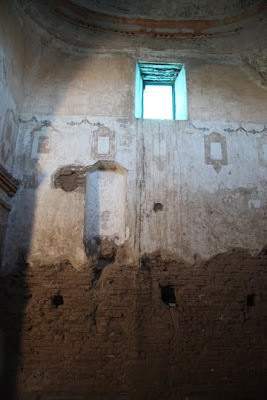 The mission had some scaffolding and tarps on the outside, indications of restoration activity. scaffolding that was outside of the mission. It was pretty amazing walking around this mission, thinking of people building it and living their lives there 200 years ago. It is contemplating time in this way that is very humbling and little scary. It helps fuel me to live each day as fully and completely as possible, and to continue to not take anything for granted, most importantly one's health, friend and family. 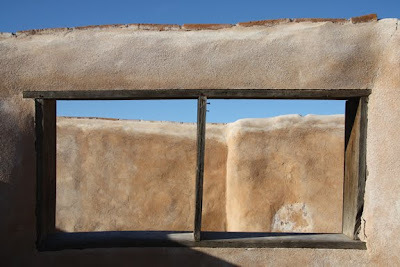 Here is an old window in one of the buildings adjacent to the main structure. Aaron and I made our way back to Wisdoms...a family-run restaurant extremely popular with locals. The conversation was convivial and relaxed as the group of us talked about past and upcoming travels, life in Arizona, careers, lives. Walt, Aaron and I discussed the upcoming book on Chris, a book of his photographs and some of my paintings. It is all very exciting and creative, a project that we are all very dedicated to. 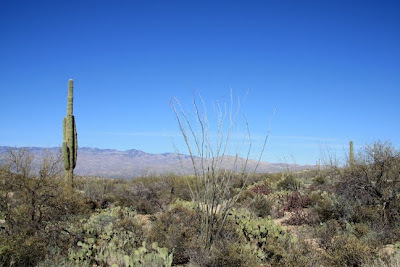 The next day we all went to explore Saguaro National Park in the Sonoran Desert. The park and preserve protect 91,000 acres of this very special desert that is home to some very unique flora and fauna, most specifically the saguaro cactus after which is it named. 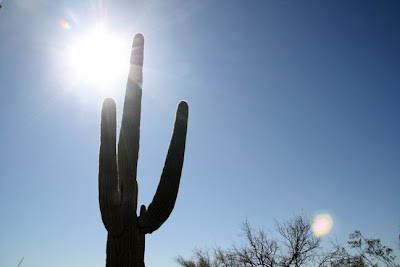 The saguaro cactus grows in a very specific climate in the desert...it an unbelievably narrow margin for growth. We drove around the park and stopped periodically to snap some photos of the landscape. The southwest, which has cast its spell around many artists and visionaries, also left a deep impression upon me. 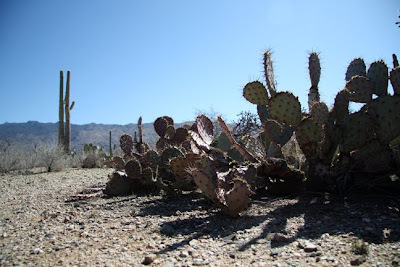 I think perhaps it is its extreme qualities, of temperature, aridity, as well as its pace, the slow seep of stored water into cacti, the flash floods that can rip across the land (the soil is too dry to absorb it quickly enough) all add to its allure....its alien qualities. In a couple of weeks the desert bloom was going to happen. It is a pity I missed it but these buds, symbols of potential, possess just as much beauty as the flowers in full bloom I think. 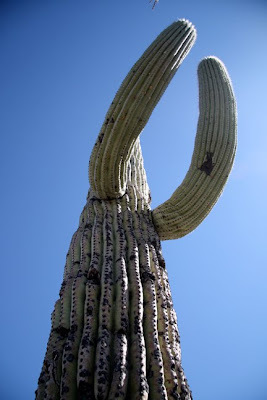 You can see why Saguaros are compared to people with outstretched arms. 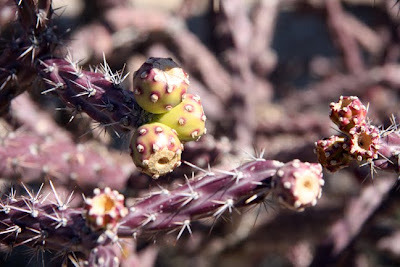 Below you can see what the cactus looks like after it has died, you can see the incredibly tough, fibrous structure underneath its already rough exterior. These plants are capable of holding a huge amount of water inside, over 1 tonne I think, perhaps upwards of 10 tonnes. 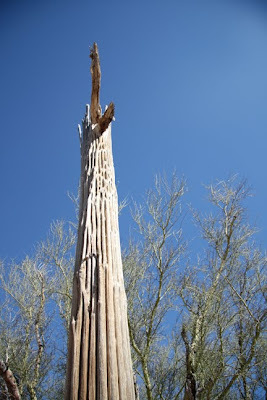 The saguaros looked positively skeletal, their insides exposed liked a secret long hidden, finally revealed. As we sat and had a picnic that Aaron and Jenn had brought I walked off a distance, careful weaving around long spikes from prickly pears, marvelling at the indigenous wildlife that thrived in that unique environment. 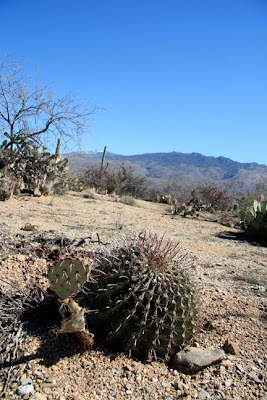 A barrel cactus, another type of cactus ubiquitous in the Sonoran Desert.